Posted October 19th, 2012 by Theresa Schlafly & filed under CNDLS, Commentary, Ideas. In a recent essay in the Chronicle of Higher Education, ﻿Charlie Wesley describes the value of annotating texts and explains that many of his students don’t seem comfortable with the practice. Our MyDante Project allows students not only to annotate Dante’s text digitally, but also to read — and respond to — annotations made by their peers. Posted September 13th, 2012 by Theresa Schlafly & filed under CNDLS. This summer, Yong Lee and I began working with Parina Patel (School of Foreign Service) to develop online materials for her undergraduate and graduate statistics courses using Carnegie Mellon University’s Open Learning Initiative (OLI) platform. Posted August 22nd, 2012 by Theresa Schlafly & filed under CNDLS, Ideas. Posted June 20th, 2012 by Theresa Schlafly & filed under CNDLS, Publications and Presentations. Mindy McWilliams, Assistant Director for Assessment at CNDLS, presented last week at the Jesuit Universities Humanitarian Action Network (JUHAN) Student Leadership Conference at Fairfield University. Posted April 24th, 2012 by Theresa Schlafly & filed under Announcements, CNDLS. Congratulations to the students in Diane Apostolos-Cappadona’s Art and Ethics course! They are currently #1 on the Wikipedia Project leaderboard, which tracks contributions that students in participating courses have made to Wikipedia. Posted April 17th, 2012 by Theresa Schlafly & filed under Articles & Videos. The question of whether to allow students to use laptops in the classroom can be controversial. In a post on the Chronicle’s ProfHacker blog, Mark Sample (professor at George Mason University and occasional CNDLS collaborator) shares some thoughts on this issue. Posted November 7th, 2011 by Theresa Schlafly & filed under Articles & Videos, CNDLS. 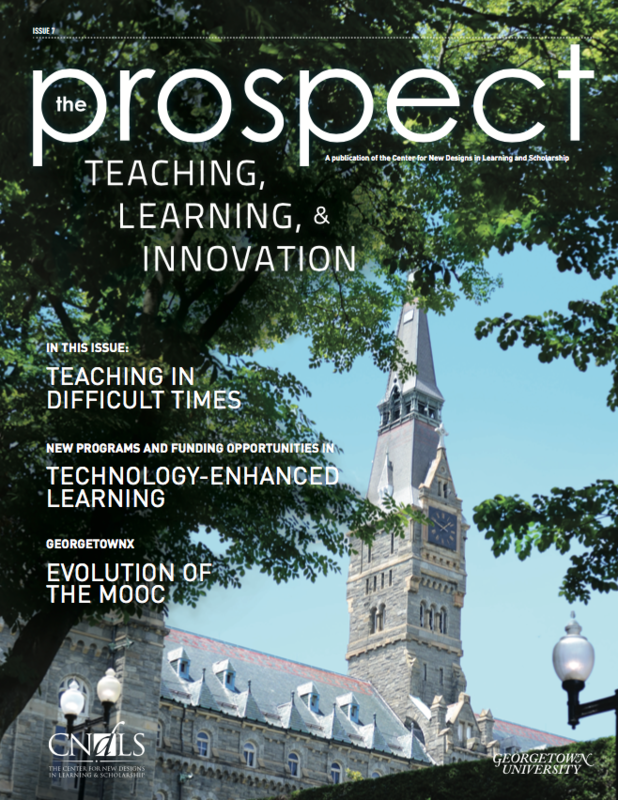 In a recent article in the Chronicle of Higher Education, Derek Bruff, acting director of the Center for Teaching at Vanderbilt University, discusses social pedagogies. He draws on work by Randy Bass and Heidi Elmendorf, as well as citing an example from GU professor Sarah Stiles (Sociology).